Captain Lonely-Gale is a Nord warrior living in Windhelm. He becomes Brunwulf Free-Winter's steward after Ulfric is deposed. He is intent on letting you know that he was a sailor: "The townsfolk call me "captain" because I used to be a sailor." He is also frequently pestered and pined after by Viola Giordano, which is evident when he sometimes greets you by saying: "Did Viola send you to bother me?" His outfit consists of fine clothes and a pair of fine boots. He is also equipped with a steel sword and carries around a selection of rich class loot and gold. He enjoys a rather relaxed life in Windhelm, although he never sleeps, spending most of his time in Candlehearth Hall, although he leaves to browse the market stalls for 4 hours at 8am, followed immediately by 6 hours wandering the city. If you ask him what sort of captain he is, he will go on to explain: "Well, nothing. At least not any more. Folk just call me that because of what I used to do. I was a sailor for many a year. I made my coin as a trader and in time, I bought my own ship. When I retired here in Windhelm, most folk already knew me as Captain Lonely-Gale, and the name just stuck." Asking what there is to do around the city, he will suggest: "If you're looking to pass the time, you can give Calixto a few septims and gawk at whater [sic] oddity he's come across lately. If you're need of goods, there's a market. If it's a soft bed and a hot meal you're after, there's Candlehearth Hall." Also asking who the prominent citizens are, he will inform you: "There's an author named Adonato staying at the inn. He's published a few works of historical fiction. The clans Shatter-Shield and Cruel-Sea see most of the gold that passes through the city. And obviously you have Ulfric, the Jarl and future High King. Oh, and that busybody Viola Giordano. She's got her nose in everyone's business, which I guess is one way of being prominent." Also during the quest Blood on the Ice, if you tell him that some locals are talking about murders, he will comment: "Terrible shame, that. Seems we have a killer on the loose here in Windhelm. He's claimed three victims that I know of, though maybe there's more that haven't been found yet. All lovely young ladies [sic], too. Let's hope the guards find that demon soon, and introduce him to the headsman's axe." As steward, Captain Lonely-Gale would have had new dialogue, which can never be heard in the base game. He could have been asked why he was chosen as steward, to which he would have replied: "Well, a few reasons come to mind. In my days as a riverboat captain, I was known to run a tight ship. That, and I made my fortune by knowing when to spend my septims and when not to. I can't stand waste." It would also have been possible to ask him about Windhelm's history, as you can ask Jorleif, although Lonely-Gale's response would have been different: "Windhelm is one of the oldest human cities in Tamriel. In fact, it was the capital of the First Empire, which was founded by Ysgramor. The Palace of the Kings in which you now stand is one of the last buildings that remain from that era. Long ago, the Empire used the city to garrison troops who guarded the passes to Morrowind. And now, thanks to you, the city is back under the Empire's banner." Captain Lonely-Gale also has unused conversations with Ambarys Rendar and Ulfric Stormcloak, which can never be heard, as he never meets either of them. Their dialogue hints that Lonely-Gale may once have been intended to be Windhelm's guard captain. Adisla will also refer to him as such during a conversation with her employer, Belyn Hlaalu. This conversation with Ambarys Rendar appears to have been intended to occur when the player first entered Windhelm, much like the conversation between Brunwulf and Malthyr Elenil in the Gray Quarter. Captain Lonely-Gale: "If anything actually happens, call a guard." Ambarys: "If the guards in the Gray Quarter weren't a bunch of n'wahs, I wouldn't be here talking to you." Captain Lonely-Gale: "My men have their orders. But it's a big city and there's a war on. Plus these murders. A few dark elves getting shoved around doesn't amount to much." Ambarys: "Typical Nord. Beard for brains." Captain Lonely-Gale: "Watch that tongue, Rendar, or your whole lot could be down with the Argonians hauling ballast by tomorrow." As guard captain, Lonely-Gale would have also met with Jarl Ulfric to discuss the problems posed by Viola Giordano's snooping and the Dunmers' hostility to the Stormcloaks. Ulfric: "Captain, I've been receiving complaints about this Giordano woman. Captain Lonely-Gale: "Yes, sir. I've been trying to quiet her, but she's insistent. She thinks she can find out who's been killing the women..."
Ulfric: "I don't care if she can find a living dwarf -- I can't have her stirring up trouble. We have enough problems as it is." Captain Lonely-Gale: "Yes, sir. I'll try to contain her." Ulfric: "See that you do. I will not let Windhelm descend into chaos over a few overactive imaginations." Ulfric: "What's the current spirit among the dark elves?" Captain Lonely-Gale: "As restless as ever, sir, but I don't see them taking any kind of incendiary action. Not soon, anyway." Ulfric: "Well that much is good. Let's finish this first war before starting the next one, eh?" Captain Lonely-Gale: "Um... yes, of course, sir." Ulfric: "Carry on, Lonely-Gale. And loosen yourself a bit." 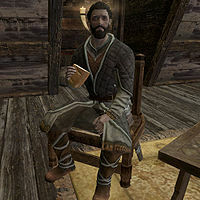 In the construction set, he belongs to the faction WindhelmSteward and has some dialogue which suggests he was supposed to become Brunwulf Free-Winter's steward if the Imperials gained Windhelm, but Jorleif remains the steward in the Palace of the Kings regardless. If the unofficial patch cannot fix this, using console commands addfac 0003662A to add him back to the Ruling Government should make him steward again. He will therefore give you the option to buy property and decorate it. He still speaks about Ulfric being a prominent citizen of Windhelm even after Ulfric is dead. His other dialogue about the prominent citizens of Windhelm will also not change if any of the others he mentions are dead. ? This page was last modified on 7 April 2019, at 04:29.